concentrate and a patented wet foam elution technology to rapidly recover microorganisms into a small final volume (~50 -85 mL) for rapid analysis. This one-pass method exponentially improves your limit of detection - especially important for detection of trace pathogens. 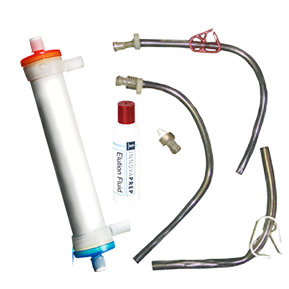 A high-flow filter cell, tubing and clamps, and an elution canister containing InnovaPrep’s Wet Foam (either Tween 20 PBS or Tween 20 Tris). Using existing head pressure or your own pump, the fluid sample is forced through the filter cell’s membranes in a dead-end configuration. The particles are trapped as the fluid is forced out of the filter cell to waste. To recover the captured particles from the filter cell, the user manually presses the elution canister into the fitting in the top of the filter cell to force the foam through the bore of the hollow fibers and dispenses into a collection container. The foam then breaks down into a liquid in just seconds. The LVC kit provides a fast and simple 1st stage concentration step prior to a 2nd stage step with the Concentrating Pipette. The InnovaPrep Concentrating Pipette will allow you to process the concentrate further to about 250 µL in minutes.